The Puranas describe Karttikeya, a son of Shiva, as the commander-in-chief of the celestial army. He is also known as Subrahmanya, Skanda, Guha and Kumara. To the Tamil-speaking people he is Murugan. The six-headed, twelve-armed Karttikeya seated on a peacock is the symbol of youth, beauty, valor and supreme wisdom. 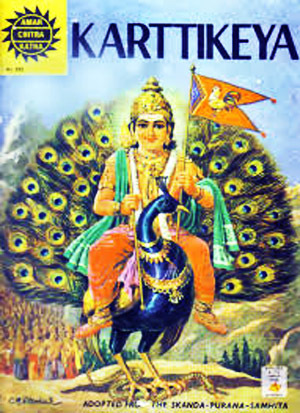 This Amar Chitra Katha is based on the Tamil version of Skanda-Purana-Samhita.